Every work of science fiction has what the Croatian literary critic Darko Suvin called a “novum”: a hypothesis or premise, some new technology, being or social organisation that radically divorces the fiction from reality. Elite: Dangerous’ novum isn’t difficult to identify—you sit inside it for the entire game’s duration. Your spaceship forms the focal point from which you view the world and interact with everything in the cosmos. Inside the cockpit, you can power up your “Frame Shift Drive” and journey to distant stars and to the most outer reaches of the galaxy. At a glance Elite’s raw sci-fi aesthetic appears radical and imaginative, yet there’s also something drearily familiar about its depiction of the future. The game’s space-faring premise is near infinite in scope, but a lot of the time playing feels more like hard work. I think there’s a good reason for this feeling though. 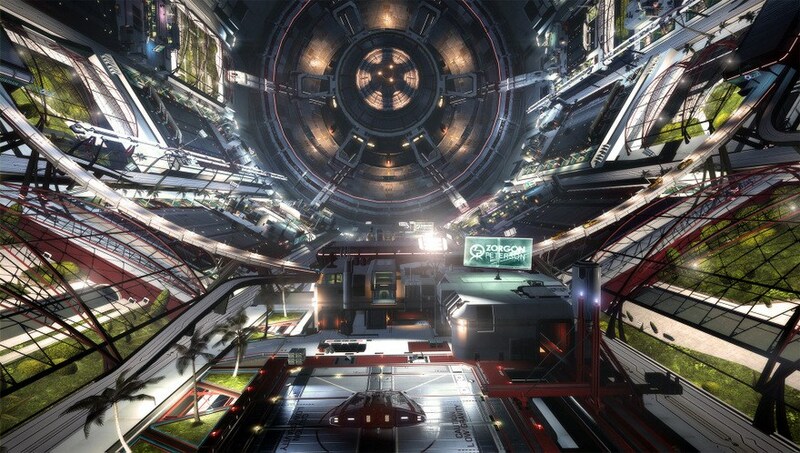 Elite: Dangerous’ vision of the future turns out to be built on top of some very old-fashioned principles. Dangerous is the fourth in a series of games that began back in 1984. To this day the original Elite is held up as a triumph of British computer engineering, with the young David Braben and Ian Bell producing an algorithm that could model over two thousand star systems for their 3-dimensional wire-frame universe. It was a revolutionary interstellar experience where players were free to partake in activities like asteroid mining, trading, piracy and bounty hunting. Your personal spaceship was once again at the centre. Fully upgradeable, it was how you measured your success in a cutthroat galaxy of outlaws and entrepreneurs. A second, more nebulous measurement was your climb towards the “Elite” status, a prestigious title granted to pilots after extensive effort and grind. It has been thirty years since the original Elite, and it’s disappointing to see so little has changed structurally. Space has expanded with Dangerous—you can now explore the entire Milky Way, 40 billion star systems, each with a variety of astronomical objects—but the basic idea remains the same. It’s still all hard work and commercial enterprise. In 1984 Bell and Braben—despite their best intentions—“captured a bit of the zeitgeist.” They made a game where outer space was shaped by the prevailing ideology of the day: a laissez-faire capitalism, where, it was said, sufficiently spirited individuals could forge their way to great wealth and success. The contradictory nature of Elite’s cosmic dream makes the most sense when placed in the context of the neoliberalism and globalisation of the 1980’s. This was a historic period when Britain under Margaret Thatcher attempted to radically adjust its economy. It was a time when trading and finance grew in importance, and (at least ideologically) things like production were said to be “disappearing.” While in real life we knew production had simply been moved overseas to places where child labour and sweatshops were far enough away from mind, Elite still refuses to give up on old abstract ideas on the free trade economy. Dangerous’ economy is a mixture of courier work and commodity trading, where you buy low and sell high. It’s also a vision of the future entirely slanted towards the supply side. It may be able to simulate the supplies and demands of countless commodities, but the realm of production is almost entirely missing. Goods appear at stations ready for brave traders and couriers to exchange and profit from. The game might be able to accurately model 400 billion star systems, but it can’t model a factory! EVE Online is an older space game that does consider production. Its commodities are all player-produced, which makes the economy far more believable, and a lot less one dimensional. Even if Elite’s image of the future does pull from ideas around British capitalism from the 1980’s, it also envisions an older and more romantic historical period. Spaceships and space stations are vital, and their sheer dimensions are undeniably spectacular. The fact that so much of life in space is based upon mining minerals from asteroids and trade via couriers means Elite’s kind of capitalism is thoroughly industrial, even Fordist. The spaceship—Elite’s novum—almost directly parallels the automobiles of the American industrialist Henry Ford. If there’s anything being mass-produced in Elite’s universe, it’s the spaceships. There are no Milky Way call-centers or quantum-based financial commodities here. Even more romantic is the fact Elite’s galaxy appears as an extended “frontier,” ripe for exploitation and the greedy ambitions of individual pilots. Like the brand of liberalism which influenced its universe, there are strong parallels with the historical “Age of Sail”—a period where ships dominated the waves and warfare always followed trade closely. If you want to succeed at Elite then dabbling in criminality is surely the way to do it. Cargo is precious, but whereas one pilot may spend time hauling rare goods across deep space—often sacrificing weapon and shield systems to maximise efficiency—another pilot may simply intercept and blow the precious cargo out from beneath it. Big weaponry is always a good investment (like in real capitalism), particularly when turned against traders. Piracy is an exploitative shortcut, but to counteract this, for everything illegal players do the game places a bounty on them, allowing and encouraging other pilots to hunt them down. This revolving system of piracy and bounty hunting is a parasite drawing energy and credits from the game’s central trading component. These interactions lead to some of the most intricate and emergent experiences possible in the Elite universe. Without them, life in your sealed cockpit would be as vacuous as outer space. Criminality seems a natural component of profiteering, and this extends to the core role of the trader too. Not all goods in Elite are created equal, some are rarer or higher in value per ton, others still are “stolen” or “contraband”. Contraband goods can be sold on the black market on select space stations. They’re more profitable than regular goods, but they’re also more dangerous as they’ll not only draw player-pirates looking to make a quick space buck but also non-playable police who randomly scan your cargo. If you’re found carrying illegal goods like slaves (beautifully abstracted, and a commodity like any other) you’ll gain a bounty and run the risk of a faction’s security forces and space stations opening fire on you. Still, with all the easy ways to make dirty money, it would be a stretch to say crime doesn’t pay in Elite. 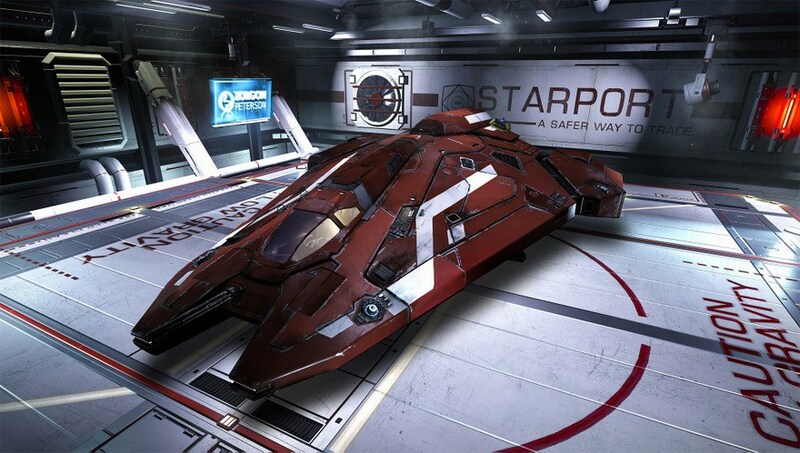 With player and combat interactions closely revolving around trade and the economy, the overarching impetus in Elite is always to increase your wealth and your “lot.” That means buying a bigger ship and fitting it with more advanced systems and weapons, and generally grinding away towards that elusive “Elite” status. If the game feels like hard work, a grind where the goals you set are often as shallow as they are unguided, it’s probably because the world of Elite feels like an image of our own. It restrictively revolves around the same kind of ideals, where the only real value is money. It’s not always like that; it definitely didn’t have to be like that. Elite could look beyond principles of profit and accumulation and to other human motivations—to things like The First Great Expedition, a community group of over one thousand pilots intent on doing the impossible and exploring all 400 billion stars. I’m not sure why we still buy into the financial grind and the lifeless space trading when there’s curiosity, adventure and discovery out there—those are the novum that tear us from reality and make science fiction what it is. Elite: Dangerous frames its world with some radical and imaginative technologies, like the spinning megastructures and kinetic spaceships that can dance as well as they can escape to the unknown. Its Milky Way is a place that captures sensations of light, time, space and gravity better than any photograph or film. But thirty years on it forces us to do the same kind of things we’ve always done. Perhaps one day we’ll get an Elite that stretches its cosmic imagination beyond the marketplace.